Players won't have to wait long to dive into Minecraft on the Nintendo Switch. The Nintendo Switch is easily one of the hottest video game consoles on the market, and to keep that title rolling, the system needs one of the biggest games in existence. No, we aren't talking about Super Mario, we're talking about Minecraft, the open-world sandbox title that's become something of a point of comparison for gaming excellence. While not demanding from a hardware perspective, Minecraft still manages to be one of the most impressive and engaging titles on any system, and the Switch version stands to be the most robust handheld version of the game yet. Being one of the most successful titles in video game history, Minecraft is unsurprisingly featured on just about every major console currently in production. The PC version is doubtless the platform of choice for most players, and though the game still isn't available through Steam, it shouldn't be hard to track down a version at popular retailers like Amazon, where a digital version of the title is currently available for $26.95. Naturally, Minecraft is also available on the PlayStation 4 and Xbox One, where users can enjoy the game in glorious 1080p from the comfort of their living rooms. Physical copies of the title run for about $15 and up to about $20, which is about what players can expect to pay for the digital version as well. The game is also available for PlayStation 3 and Xbox 360 at similar price points for those gaming fans still stuck in the previous console generation. Portable players are likely very familiar with Minecraft Pocket Edition, the mobile phone- and tablet-oriented version of the title which is readily available through the Google Play or Apple App Store for $6.99. Despite being less robust than the full version of the game, Minecraft Pocket Edition is still a huge hit, with tens of millions of downloads for mobile systems. Lastly, and perhaps fittingly, are the PlayStation Vita and Wii U versions of Minecraft. These two versions of the title isn't as full-featured as the PC version of the game, nor are they as slimmed-down as Minecraft Pocket Edition -- instead, they're simply solid versions of the game that happen to be the only way to play Minecraft on the go until the title lands on the Nintendo Switch. The PS Vita version of Minecraft costs about $15 or so, which is about to be expected, but players will have to pay nearly twice that to enjoy the game on Wii U. While it's true that Minecraft for the Nintendo Switch will eventually get a physical release, Nintendo doesn't have any firm comments toward that front at the moment. With that said, they have announced that Minecraft for the Nintendo Switch will be available through the eShop this Thursday, May 11, for $29.99. Players picking up the Nintendo Switch version of Minecraft can expect to see a few exclusive Nintendo-themed goodies in the form of a map and texture pack based around Nintendo's iconic mascot. Players can also expect up to four-player split screen gameplay, eight-player online play, and map sizes well in excess of what the Wii U version of the title could handle. 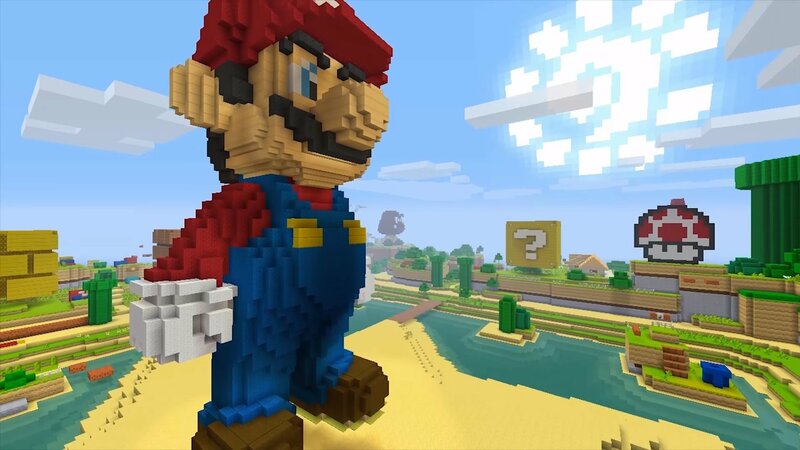 Anyone who picks up Minecraft through the Nintendo eShop can expect to see most of the major content that's been introduced through the game's updates through the years, and the exclusive Mario DLC will be included within the title's $29.99 asking price. Looking for more great games to play on your Nintendo Switch? Check out some of the titles featured on our list of the Best Nintendo Switch Games.